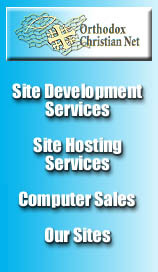 The following sites represent a small sample of the many different sites we have designed and created. We were able to include only those sites which our clients gave us permission to display. Welcome to Come Receive The Light, the National Orthodox Christian Radio Program. We provide personalized letters and postcards from Santa to you. Welcome to Saint George Antiochian Orthodox Christian Church, Washington DC. Father Paul Saliba and the Faithful of Saint George Antiochian Orthodox Christian Church greet all of you and welcome you to join our Family. This web site is for our extended Rafeedie/Rafidi Family and it's related branches. We use it to advertise the Rafeedie/Rafidi Family presence on the Internet, publish and distribute the Rafeedie Family Newsletter, to share the news of general importance with all of the Rafeedie Family, and basically just have a great time with one another in Cyberspace! Currently you will find an article on The Transfiguration written by Father Thomas. Songwriting, recording, performing and work within the Orthodox Christian world have made Andrew Anthony one of the most recognized performers in Orthodox circles today. With studies in classical piano, classical voice production, guitar and acting, Andrew uses his combined talents to deliver the timeless message of Christ�s salvation in an original, powerful, creative and relevant way to people of all ages. Orthodox Christian Net provides you the very best in Web Design and Web Hosting. We specialize in hosting Orthodox Christian Web Sites. Copyright © 1997 — 2003 Orthodox Christian Net, LLC All rights reserved. Last modified Mon, 12 Jan 2004 05:06:45 GMT.